The Asian Human Rights Commission (AHRC) has learned that Mr. Charles Hector Fernandez, a human rights defender and lawyer, is facing threats of legal action by Asahi Kosei (M) Sdn. Bhd. Company, a company employing migrant workers. The Company claimed that Mr. Fernandez posts on the plight of Burmese migrant workers were libelous. The legal action on Mr. Fernandez not only threatens free speech, but suppresses human rights defenders from exposing the plight of migrant workers. In Malaysia, violations of human and labour rights of migrant workers by employers and the authorities mostly go unreported. Mr. Charles Hector Fernandez is a lawyer and a former member of the Malaysian Bar Council. He is also an active human rights defender and a Blogger, running the Blog: charleshector.blogspot.com. In his Blog, he has been raising the issue of human rights violations against a group of Burmese migrant workers in relation to the Asahi Kosei (M) Sdn. Bhd. Company, a subsidiary of the Asahi Kosei Japan Company Limited, a Japanese company operating in Malaysia which manufactures components for video equipment, hard disk drive and automotive parts. The issue involves about the complaints of 31 Burmese migrant workers regarding the non-compliance of agreement by their employer. The workers alleged that the employer was paying them far less than what was promised. In the process of seeking compensation and fair treatments, the workers alleged that they were threatened by gangsters and two of them escaped from being sent back to Burma. They have lodged formal complaints with the Malaysian Human Rights Commission (SUHAKAM) and the Labour Department. On 14 February 2011, Mr Charles Hector Fernandez received a letter from the lawyer of the Asahi Kosei (M) Sdn. Bhd. Company (full text of the letter). 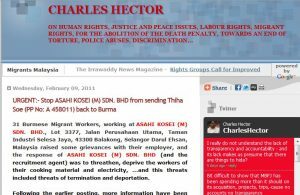 The letter claims that the postings about the plight of the Burmese migrant workers from Mr. Charles Hector’s Blog amount to a libel on the company. The company demands from Mr. Charles Hector Fernandez within 7 days the sum of RM 10,000,000.00 (USD 3,279,307) an apology and an immediate withdrawal of the posts. In the said complaint and demand letter, written by the company’s legal representative, T.S. Teoh & Partners, the Company denied all the allegations. They claimed the workers, whom Mr. Fernandez had referred to, were supplied by an outsourcing agent and are not under the direct payroll of the company. This argument of passing the responsibility on the employment agencies is commonly used by Corporations having operations in underdeveloped countries, like in the Philippines and Thailand, to excuse themselves from legal responsibilities. The information posted on the Blog was obtained from the affected workers. They are representing the complaints made by the migrant workers who are always in the vulnerable position to voice out their grievances and demands. Human rights defenders such as Mr. Charles Hector Fernandez are playing an important role to channel the complaints of the disadvantaged to the public and to express concern. It is a matter of public interest to ensure the grievances of any persons whose human rights being violated to be heard. Without it, there is no access to justice. The company had been given the opportunity to respond. Mr. Charles Hector Fernandez sent two emails on 8 and 9 February 2011 to the Asahi Kosei (M) Sdn. Bhd. Company about the matter. However, the company did not respond to these emails. Instead, the Asahi Kosei (M) Sdn. Bhd. Company sent a letter to Mr. Charles Hector Fernandez demanding RM 10,000,000 for damages. The threats of commencing legal action for libel by the Asahi Kosei (M) Sdn. Bhd. Company against Mr. Charles Hector Fernandez poses a threat to human rights defenders who are actively raising these issues to defend the rights of migrant workers. Please write to the companies and the authorities listed below to express your concern in this case and call for the withdrawal of commencing legal action for libel and demand for damages against Mr. Charles Hector Fernandez. Name of company threatening to take legal action: Asahi Kosei (M) Sdn. Bhd. Company, a Japanese company manufacturing components for video equipment, hard disk drive and automotive parts. About the complaint: The Company claimed that his blog posts on February 8 & 9, 2011 are libelous. The Company’s legal representative, T.S. Teoh & Partners, wrote a letter to Charles Hector dated February 11, 2011 (but was served on February 14) demanding from him RM10,000,000 (USD3,279,307) as payment “to vindicate our clients” within seven days from the receipt of the letter. I am writing to express my deep concern regarding the case of Mr. Charles Hector Fernandez. I am informed that Mr. Charles Hector Fernandez has received a letter on 14 February 2011 sent by the Asahi Kosei (M) Sdn. Bhd. Company through its lawyer. The letter claims that the posts about the plight of a group of Burmese migrant workers from the Blog of Mr. Charles Hector Fernandez amounts to a libel on the company. The company demands from Mr. Charles Hector Fernandez within 7 days the sum of RM10,000,000, an apology and an immediate withdrawal of the postings. Mr. Charles Hector Fernandez is a lawyer and a former member of the Malaysian Bar Council. 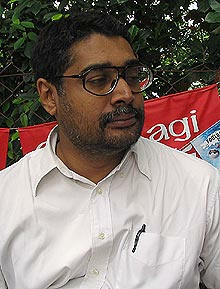 He is also an active human rights defender and a Blogger, running the Blog: charleshector.blogspot.com. Recently in his Blog, he has been raising the issue of human rights violations against a group of Burmese migrant workers in relation to the Asahi Kosei (M) Sdn. Bhd. Company, a subsidiary of the Asahi Kosei Japan Company Limited. The issue concerns the complaints of 31 Burmese migrant workers about the non-compliance of agreement by their employer. The workers alleged that the employer was paying them far less than what was promised. In the process of seeking compensation and fair treatment, the workers alleged that they were threatened by gangsters and two of them escaped from being sent back to Burma. They have lodged formal complaints with the Malaysian Human Rights Commission (SUHAKAM) and the Labour Department. The situation of this group of Burmese migrant workers was reported in the Blog of Mr. Charles Hector Fernandez. The information posted on the Blog was obtained from the affected workers. They are representing the complaints made by the migrant workers who are always in a vulnerable position when it comes to voicing out their grievances and demands. Human rights defenders such as Mr. Charles Hector Fernandez are playing an important role to channel the complaints of the disadvantaged to the public and to express concern. It is a matter of public interest to ensure the grievances of any persons whose human rights being violated to be heard. Without it, there is no access to justice. The company had been given the opportunity to respond. Mr. Charles Hector Fernandez sent two emails on 8 and 9 February 2011 to the Asahi Kosei (M) Sdn. Bhd. Company about the matter to which the company did not respond. Instead, the Asahi Kosei (M) Sdn. Bhd. Company sent a letter to Mr. Charles Hector Fernandez demanding RM 10,000,000 for damages. The commencement of legal action for libel by the Asahi Kosei (M) Sdn. Bhd. Company against Mr. Charles Hector Fernandez poses a threat to human rights defenders who are actively raising these issues to defend the rights of migrant workers. I therefore call for the withdrawal of commencing legal action for libel and demand for damages by the Asahi Kosei (M) Sdn. Bhd. Company against Mr. Charles Hector Fernandez. 1. Asahi Kosei (M) SDN. BHD. 2. Asahi Kosei Japan Co. Ltd.